The critic J. Hoberman once described the Turkish filmmaker Yílmaz Güney as “something like Clint Eastwood, James Dean, and Che Guevara combined”, (1) and for anyone familiar with the particulars of his career, it’s sometimes astonishing that this roughneck-star-auteur ever actually existed. A wildly popular action movie star whose bloody genre knockoffs gave way in the 1970s to an intensely humanist and politically committed cinema, he not only became Turkish cinema’s leading figure (not to mention its only representative on the international stage), but also its renegade outlaw prince. More than two decades after his untimely death in exile, his spectre haunts Turkish cinema today: his face can still be seen on the covers of numerous magazines, and several films – both documentary and fictional – have been made about his life over the last decade. What accounts for Güney’s resilience in Turkey, after all these years? Oddly enough, it might be what initially seems to be a failing of his work: despite his political commitment, Güney’s films often lacked the discipline to lay out or support any specific ideology. He was at heart a provocateur, and his films bear the scars of his desperation, both in their narratives and in their very being. Over and over again, Güney’s narratives collapse in on themselves, veering off in different directions as his characters lose their tenuous grip on reality. As a result, his films never offer solutions; when they seem to, they undermine the stated solutions in blunt, unusual ways. Güney is the poet of helplessness, exasperation and madness. As such, his perspective has managed to outlive the political fads of his time. 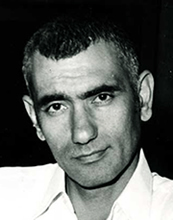 Yílmaz Güney was born Yílmaz Pütün in 1937, near the city of Adana, in Turkey’s Southeast. The details of his ethnicity are somewhat disputed. One or both of his parents may have been Kurds. In recent years, Güney’s films have sometimes been identified with the Kurdish nationalist movement in Turkey, although his own statements on the movement during his lifetime were often contradictory, even after he fled Turkey. It’s more likely that he identified with the movement somewhat not because of any kind of ethnic solidarity, but because he recognised in it the aura of the oppressed. Güney did flirt with Marxism early in his life, and revolutionary politics would figure prominently in his career. His related struggles with the law, which would also consume so much of his career, started early as well: although his first jail sentence came in 1961, it was for potentially “subversive content” in a short story written in 1956, when he was still in high school. 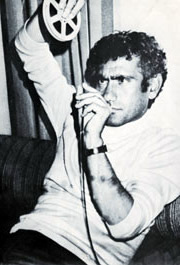 Although Güney is thought of as an actor-turned-director, his beginnings in film were initially behind the camera, as an assistant and screenplay collaborator to the director Atíf Yílmaz on the 1958 films Bu Vatanýn Cocuklarý (This Nation’s Children) and Alageyik (The Fallow Deer); he would also take a lead role in the latter film. His onscreen intensity immediately struck a chord with viewers: by the early 1960s, despite (or partially because of) his 18-month prison sentence, Güney had become a star, making as many as 20 films a year in the drunken heyday of the Turkish film industry. Most of the films he appeared in were cheap, violent genre knockoffs that proved inordinately popular in Turkey’s rural Anatolian heartland. Some of their English titles are quite revealing: I’ll Plug All Three of You, The Bullets of Damnation, I Swear By My Gun, The Bodies Float in a River of Blood, The Blood Will Flow Like Water, Güney Spreads Death, My Signature is Written in Blood. An enthusiastic gun owner, famous for his late-night carousing and his drunken brawls, Güney was dubbed “The Ugly King”: his visage was a bracing corrective to the endless stream of clean-cut, handsome leads who had previously reigned in Turkish cinema. Urban viewers and elites initially scorned Güney’s films as little more than disposable entertainment for the rural masses. But they too would eventually come around: it helped that Güney also gave surprisingly tender performances in films such as 1966’s The Law of the Borders (Hudutlarýn Kanunu), from the veteran director Lütfü Akad. Güney’s directorial debut came with the 1966 programmer At Avrat Silah (Horse, Woman, and Gun). This was quickly followed by 1967’s Benim Adým Kerim (My Name is Kerim) and Bana Kursun Islemez (Bullets Can’t Hurt Me). Although his early films all followed the simple mold of the revenge dramas and crime thrillers that had made him a star, two works stand out from this period: Seyyit Han (The Bride of the Earth) (1968) and Aç Kurtlar (The Hungry Wolves) (1969). Both works display a stark naturalism that sets them apart from the other genre quickies of the period. The Bride of the Earth, though still in essence a rural revenge drama, contains surprising moments of quiet lyricism that suggest Güney was becoming familiar with the cinema of Satyajit Ray and Roberto Rossellini. Güney’s artistic breakthrough came with Umut (Hope) in 1970, generally acknowledged as his first masterpiece. In it, Güney himself plays Cabbar, an impoverished, naive horse-cab driver duped into searching for buried treasure. Those familiar with the actor/director’s earlier work will recognise the victim narratives of those violent genre films in the early scenes of Umut. But instead of getting even, Güney’s character descends further and further into delusion, until the film becomes an ironic, surreal, at times bitterly comic, repudiation of its title. The actor’s rough persona had not prepared Turkish moviegoers for the delicate, haunting nature of his mature cinematic work. Stylistically, Umut starts off as an exercise in stark realism, and gradually shifts to a more mytho-poetic register. But maybe not mytho-poetic enough: despite numerous awards and a theatrical run, the film was eventually deemed politically subversive and banned for a period by the authorities, which only helped make Güney even more popular than before among viewers. Umut‘s troubles with the authorities proved to be prophetic in terms of Güney’s cinema. Although the 1970s were his most artistically accomplished decade, Güney would spend most of this period in prison. He was arrested again in March 1972, for harboring anarchist refugees accused of a political assassination, only to be released under a general amnesty in 1974. But he was then re-arrested in September 1974, this time for the murder of a judge during a late night drunken brawl at a restaurant, during the shooting of Endise (Anxiety). The details of the event are still not clear: Güney’s associates claimed that the director was merely recording gunshots for post-synchronisation purposes. Despite the unlikely nature of that story, much of Güney’s mythology today rests on the belief that he was wrongfully convicted. Either way, he would spend the rest of the decade, as well as the early 1980s, in prison. Amazingly, some of his most notable films from this period, including 1978’s Sürü (The Herd), 1979’s Düsman (The Enemy) and 1982’s Yol, were directed by proxy, with the convict-auteur writing, producing and smuggling out directions to trusted surrogates. Umut heralded a new direction in Güney’s filmmaking, but the director-star was not yet prepared to abandon his popular image, and the films that immediately followed were more disposable melodramas and action thrillers such as Canlý Hedef (Live Target) (1970), Umutsuzlar (The Hopeless Ones) (1971) and Kacaklar (The Fugitives) (1971). However, with 1971’s Baba (The Father), Güney again seized the cultural spotlight. Like Umut, Baba begins as a grimly realistic portrait of a desperate family man under relentlessly miserable circumstances. Güney plays Cemal, a worker who does minor jobs for some gangster/businessmen (in Güney’s world the two are usually interchangeable). He tries to find work in Germany, but can’t pass a physical. After being told his family will be well provided for, he takes the fall for a crime committed by his rich boss. Needless to say, his family is not provided for. As it progresses, Baba becomes a more standard revenge picture, not entirely different from Güney’s earlier action films. While in prison, Cemal becomes a vengeful, well-respected tough guy. The film’s uneasy embrace of benevolent gangsterism flies in the face of the incisive class politics of its earlier scenes. Whereas Umut drifted towards a surreal kind of poetry, Baba displays a populist anger that suggests Güney was trying to create a cinema that would encompass both his personae, that of the Marxist artist and the populist roughneck. Over and over, one finds these tonal shifts in Güney’s films. They begin as grim portraits of social anguish, and then veer off in bizarre, sometimes contradictory directions. A less generous view might suggest that Güney didn’t quite know what to do with his stories – that he was very good at portraying societal despair, but was at a loss for developing resonant stories out of it. But the shifts seem too planned, too deliberate, to be chalked up to mere inadequacy. Güney’s work has been compared to that of Third World filmmakers such as Glauber Rocha or American “primitives” such as Samuel Fuller. But perhaps a more appropriate comparison is to the Italian filmmaker Pier Paolo Pasolini, with whom Güney shares a distinctly anti-Utopian, renegade classicism. The Turkish critic Atilla Dorsay has written of the director’s films as classical tragedies. (2) Güney’s tonal shifts might be better understood in that light: As in Pasolini’s Teorema (1968) and Porcile (1969), political awakening often leads to social and psychic meltdown. 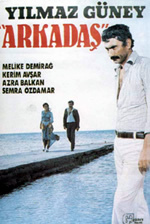 Perhaps the two films in Güney’s oeuvre with the most jarring tonal shifts are 1974’s Arkadas (The Friend) and Anxiety. The former, one of his most ambitious works, is something of a departure in setting for the director, as its milieu is decidedly bourgeois. Güney plays Azem, a public worker who comes to visit his prosperous childhood friend Cemil (Kerim Afsar) amid the decadent tranquility of an upper middle-class summer tourist village. The militant, class-conscious Azem is angered by what he perceives as Cemil’s selling out of his youthful activism and small-town roots. He finds himself at odds with Cemil’s petit-bourgeois wife, and begins to try to indoctrinate the youth of the village into the class struggle. The film’s idyllic, relatively conventional narrative style then gives way to a stylistically splintered, elliptical second half, much of it set among the rural poor, as Azem takes Cemil back to their village, where Cemil begins to see the error of his ways and becomes increasingly suicidal. More successful, though troubled in all sorts of other ways, was Anxiety, the film Güney was directing at the time of his final arrest. Broadly, it tells the story of a group of migrant cotton workers near Adana. Its primary focus, however, is Cevher (Erkan Yücel), a family man desperate to earn money to buy back his freedom thanks to his involvement in a blood feud. When his fellow laborers go on strike, Cevher cannot afford to cease working. Stylistically, Anxiety is a bizarre blend. It begins almost like a documentary, astutely weaving its fictional characters into a verité-style narrative full of delicately observed moments. But its second half is more agitprop, as if Terrence Malick’s Days of Heaven (1978) had been hijacked by Soviet filmmakers. Despite all that, politically Anxiety represents an advance for Güney: his presentation of Cevher’s dilemma is relatively free of didacticism. The film’s moments of agitprop come off as projections rather than anything resembling reality. Indeed, the hyper-expressionism of Anxiety‘s later scenes are decidedly unreal – there may even be a bitterly mocking undertone to Güney’s portrait of labour activism, as if to underline the futility of action in such a repressive society. After Güney re-entered prison, he had to rely on his former assistants to carry out his orders on set (Serif Gören is credited as co-director on Anxiety). He also no longer had himself as an actor, a considerable factor given the enormous superstar persona he had developed over the years. 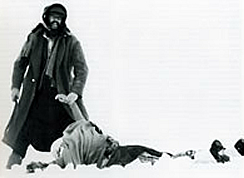 One film, Zavallýlar (The Poor Ones) (1975), starring Güney, was virtually abandoned halfway through, ending on a freeze-frame of the actor and released incomplete. But the three films Güney would now write and produce proved to be three of his best, most acclaimed works. The issue of Güney’s authorship over films he didn’t technically direct is one that requires addressing. There was certainly something odd about the fact that it was producer Güney and not director Serif Goren who received the Palme d’Or for Yol in 1982. Still, Güney, despite his incarceration, had a very unique amount of control over his remote sets. Highly detailed shot lists were smuggled out of prison. He was allowed to watch dailies, order re-shoots, and even edit in prison. Although his surrogate directors were able to smuggle in aspects of their own styles into the films (one can see some quite marked differences between the austerity of Sürü and the epic melodrama of Yol), a glance at the films they later made without their master suggests that Güney’s authorship over these works was nearly complete. Sürü, directed by Zeki Okten, portrays the lives of desperate Kurdish farmers in Turkey’s backward Southeast. An impoverished family, already suffering from the effects of a blood feud with a neighbouring clan, has to transport a herd of sheep to the capital city of Ankara. The episodic narrative follows them from the wastes of Turkey’s mountainous Southeast, to an apocalyptic train ride, and finally to the big city itself. Along the way, we watch the herd gradually depleted: first, as bribes that have to be paid to officials and train conductors, then by illness and injury, and then by sabotage. In Ankara, the family is torn apart by madness, death, and poverty. The final scene has the family’s patriarch running through the crowded city, desperately searching for his lost son, one more mad man wandering the streets. The combination of Güney’s fable-like vision of the film and director Okten’s solid sense of storytelling made for one of Güney’s most successful works. Sürü won the Golden Leopard at Locarno and awards at Berlin, as well as Turkish film festivals. Okten also directed The Enemy, a sprawling portrait of a disintegrating marriage. Grimly realistic, it tells the story of Ismail (Aytac Arman), a man looking for work to help support his family and his flighty, spendthrift wife. Although the wife is initially seen as dim, greedy and unfaithful, Güney identifies the real culprit as the society at large, forcing unrealistic and destructive ideals on the uneducated poor. His diffuse screenplay also tackles topics as disparate as Greek–Turkish relations and foreign tourism. But somehow, Okten and Güney hold it all together. Though criticised by some writers for its rambling ambitions, The Enemy today seems like one of Güney’s most accessible, most stylistically unified works. The 1980s brought a renewed period of political repression in Turkey. A coup in September 1980 and subsequent military rule resulted in dire circumstances for Güney, who had little of the freedom he previously enjoyed in his earlier prison stays. (His folk hero status had usually guaranteed that he’d be idolised by both his fellow inmates and his military captors.) Even so, Güney was able to pull off his greatest accomplishment yet from behind bars. Yol was a massive undertaking, a sprawling portrait of Turkey hovering on the edge of chaos. The film tells the story of five prisoners, several of them Kurds, given brief leaves to visit their families, and who, for various reasons, do not return; the Turkish social landscape is presented as being little different from the world behind bars. The film encompasses the disintegration of family relations, the civil war against Kurdish guerillas, and the oppression of women. As with The Enemy, Güney’s ambitious conception found its ideal realisation in the hands of another director: Yol was originally slated to be directed by Erden Kýral, but Güney quickly replaced Kýral with Serif Gören, who had effectively completed Anxiety some years earlier. (In 2005, Kýral would release Yolda, a fictional dramatisation of this period.) Gören’s facility with actors and his feel for the rhythms of daily life served Yol rather well. For all its digressions, Yol is sharply focused, stylistically unified. It’s also incredibly sad and haunting: it was Güney’s most pessimistic film to date. After production was completed, Güney fled prison in 1981, and completed Yol abroad. Then, he appeared at the 1982 Cannes Film Festival, with Interpol hot on his tail, won the Palme d’Or, and just as quickly disappeared. His mythology, needless to say, hit the stratosphere. Many of his films had already been banned in Turkey, but he finally became official persona non grata in his home country, at the same time he was being hailed as the Zorro of international filmmaking. Güney’s high profile would only translate into one final film, however. He relocated to France and set to work on Duvar (The Wall) (1983), a grim depiction of life inside a Turkish prison, shot in Paris. The despair of Yol did nothing to prepare audiences for this chamber of horrors, however: much like Pasolini’s Salo, The Wall is almost unwatchable in its portrayal of the horrors of prison. Much of Güney’s cast were children, and even the film’s production proved too intense for some: a contemporary documentary made for French television shows Güney being somewhat abusive towards his cast, trying to provoke an emotional response. (Perhaps he was thinking of his neorealist idol Vittorio De Sica, who had reportedly put lit cigarettes in the pocket of one young actor to get some real tears out of him.) By the time The Wall was released, it was unable to match the critical or financial promise of Yol. Seen today, for all its flaws, The Wall displays a remarkable degree of directorial control, uncharacteristic of Güney, suggesting that his newfound financial and political freedom might have resulted in a more stylistically unified, accomplished cinema. That, however, was not to be. Güney died of stomach cancer in 1984, still in exile in Paris, his final film’s unblinking despair an eerie prophecy of his own sad end. Güney’s whirlwind career didn’t quite end with his death, however. His films had been banned in Turkey, thus ensuring his folk hero status for years to come. It wasn’t until the early ’90s that Güney’s films began to reappear in theatres and on television there; by the end of the decade, they were being released on video and VCD as well, along with numerous documentaries about his life. Some have now begun appearing on DVD, which bodes well for further international exposure to his work: although Güney’s face on the cover of a magazine can still guarantee runaway sales in Turkey, he has slid into obscurity on the international stage, partly due to the lack of a major retrospective of his films. Along the way, however, an intriguing turf war has begun to emerge over the director’s films. Kurdish nationalists see in him one of their own, a countryman who was never allowed to express his true ethnicity until the very end of his life. The intellectual Left sees in him the makings of a true political auteur, a cross between Satyajit Ray and Gillo Pontecorvo. Even conservatives recognise in his work a certain revulsion at the decadent aimlessness of Western life. In a way, Güney himself, despite his ardent political activism, managed to fuel this kind of controversy. He may have considered himself an ardent Marxist, but his political ideology wasn’t particularly well thought-through. What made him an engaging filmmaker was precisely what would have made him a terrible politician: his class struggle was the stuff of populist melodrama, not the dry socialism of a state seizing the means of production. As such, he became an icon for the powerless in all segments of society, be they left-wing or right-wing, Turkish or Kurdish, nationalist or socialist. Fierce, vital and undisciplined, his work today is ready for rediscovery by Western audiences. Nihat Behram, Yílmaz Güney’le Yasaklý Yýllarýmýz (Our Forbidden Years with Yílmaz Güney), Gendas Kültür, Istanbul, 1998. Atilla Dorsay, “Yílmaz Güney Uzerine” (“On Yílmaz Güney”), San Remo Film Festival booklet, March 1977. Atilla Dorsay, “Arkadas”, Yílmaz Güney Kitabý (The Yílmaz Güney Book), Güney Filmcilik Yayýnlarý, Istanbul, 2000. Bilge Ebiri, “Turhan Feyizoglu: Yílmaz Güney: Bir Cirkin Kral” (review), Wasafiri, issue 43, autumn 2004. Turhan Feyizoglu, Yílmaz Güney: Bir Cirkin Kral (Yílmaz Güney: An Ugly King),Ozan Yayýncýlýk, Istanbul, 2002. J. Hoberman, “Listen, Turkey”, Village Voice, November 23, 1982. Hasan Kiyafet, Mahpus Yílmaz Güney (Yílmaz Güney the Convict), Doruk Yayimcilik, Ankara, 1996. Giovanni Scognamillo, Turk Sinema Tarihi (A History of Turkish Cinema), Istanbul, Metis, 1987. An interview with Güney on The Wall, taken from The Middle East Magazine, January 1983. Also available in French. Short piece on Yol by Acquarello in Strictly Film School. An excellent chronological overview of Turkish cinema, with extended reference to Güney. An introductory essay about Kurdish cinema by Amir Hassanpour, originally published in Philip Kreyenbroek and Christine Allison (eds), Kurdish Culture and Identity, Zed Books, London, 1996. Atilla Dorsay, “Arkadas”, Yílmaz Güney Kitabý (The Yílmaz Güney Book), Güney Filmcilik Yayýnlarý, Istanbul, 2000, pp. 108–111.